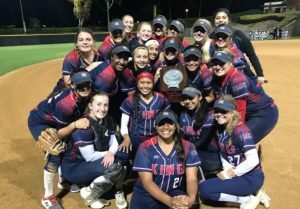 King High School’s softball team scored two runs in the top of the eighth inning Saturday and went on to defeat Edison 4-2, in the championship game of the Alan Dugard Classic Saturday night at Deanna Manning Stadium in Irvine. With the tiebreaker in place, Tiffany Illif drove in the first run then Aaliyah Rivas knocked in the second run for the Riverside team. King pitcher Amiyah Aponte, who went the distance, retired Edison (15-8) in order in the bottom of the eighth inning. She wound up with 10 strikeouts and scattered six hits. “Obviously, I’m really, really proud of them,” said Edison Coach Melisa Roth.”I thought they competed the whole game and we just came out on the short end of it. Edison moved out to a 2-1 lead in the third inning when Serena Starks singled, went to second on a passed ball, stole third and scored on a wild pitch. But King (11-6) scored a run in the top of the seventh to send the game to extra innings. “It’s been a little bit of a roller coaster this year for us, we’re still sort of finding our way,” said King Coach Chantal Millard. “We lost 11 seniors so we’re a brand new team. We’ve been working a lot on the mental game because I know that all these girls have so much talent. It’s just getting them to come out and play as hard as they possibly can. Rivas had two doubles and scored two runs for King and Starks and Isabella Espinoza had two hits each for Edison. Edison got to the championship game by defeating La Serna 6-5. King defeated Esperanza 5-2 to advance.